Newborns generally eat, poop, and sleep around the clock in the early days, but what does a newborn’s sleep schedule typically look like? 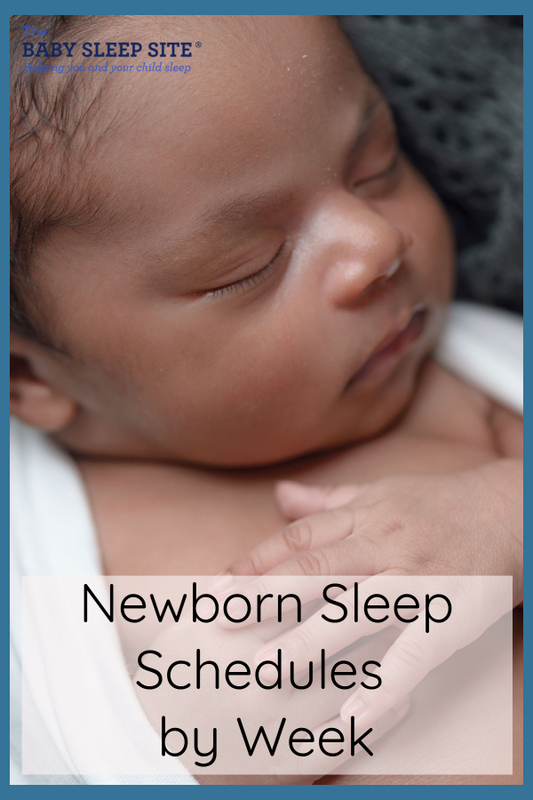 This post shares sample newborn sleep schedules by week. You can peruse all the schedules by scrolling down or use the quick links below. You may also want to bookmark this page for future use or get more comprehensive sample schedules and schedule guidance in our e-book, Essential Keys to Your Newborn’s Sleep. A 1-week old will sleep upwards of 16-18+ hours in a day, but babies this age tend to sleep in “chunks” of 2 hours at a time and will need to eat that often. It is important to feed 1-week-old babies often to ensure proper weight gain and, if you’re breastfeeding, it helps establish your milk supply. So, even if your baby wants to sleep longer than 2 hours, you will need to wake him or her to feed. It’s very likely your baby will go right back to sleep after a feeding and diaper change quite a bit of the time. Or, at least, it might feel that way. Another thing to keep in mind is that your baby’s “night sleep” will not be very long just yet. Late bedtimes are common at these younger ages and we often need to begin to correct day/night confusion. A 2-week-old doesn’t differ too much from a 1-week-old in that your baby will sleep most of the day, approximately 16 hours, on average. But, again, the sleep is broken into “chunks” where some naps will be longer than others. If your baby still has day/night confusion, you may want to start trying to keep them awake for at least 45 minutes multiple times a day and avoid naps longer than 3 hours. At 3 weeks old, your baby may begin to stay awake a bit longer during the day up to one hour or so but still will need to sleep about 16 hours in a 24-hour period. He or she may also begin to become a bit fussier, in general. This is normal as babies sometimes have a hard time adjusting to the outside world. Their central nervous system is maturing and developing. Again, which naps are longer will vary baby to baby and maybe even day to day for the same baby. A schedule is beginning to emerge! If your baby is sleeping a single 5-hour stretch, congratulations! This is considered “sleeping through the night.” Of course, you may not be sleeping all night just yet. Some babies, especially formula-fed babies, might be sleeping in even longer stretches at night. Some babies have increased their bottle sizes during the day while others haven’t. The key is that they are eating enough in a 24-hour period. Breastfed babies may still be eating three times a night. By 8 weeks old, many babies are sleeping longer at night and we start to see earlier and earlier bedtimes as your baby lengthens nighttime sleep to 11-12 hours and they nap 3-4 hours during the day, on average. They still need ~14-16 hours of sleep in a 24-hour period. However, if your baby still has a later bedtime, that isn’t too uncommon. Until your baby is sleeping 11-12 hours at night, you really don’t want an 8 PM or earlier bedtime else you will have to start your day WAY too early! In addition, your baby may have been eating just 1-2 times a night but once they lengthen their nighttime sleep, this might mean a night feeding creeps back in, temporarily. Some babies are beginning to transition away from swaddling which can become problematic. This can lead to more night-waking and shorter naps. In addition, there is commonly an 8-week growth spurt to keep in mind. Please note: Not all babies, especially breastfed babies, can transition to just two night feedings by this age, especially if they are in bed 12 hours. Some babies are still getting three night feedings and that would be within averages. 12-week-olds (or 3-month-olds) are starting to approach the time when we start to see more sleep problems if you haven’t seen them up to this point. Naps sometimes get shorter and it may be harder to stick to your schedule or eat-play-sleep routine. Your baby still needs 11-12 hours of sleep at night and 3-4 hours during the day, but the total average sleep is right around 14 hours. Of course, by definition, some babies will need more and some will need less. If your baby needs less, developing a 3-month-old schedule is usually more difficult. Ideally, you’d keep your baby awake no longer than two hours at a time. At 16-weeks-old, the main sleep problem we see is the famous 4-month-sleep regression. Babies tend to wake up frequently at night and take short naps after this regression begins. But, keep in mind, this can occur as early as 12 weeks old or as late as 5 months old. For some babies, they will go back to sleeping well while others will need more help learning how to sleep in longer stretches at night and take longer naps. If you haven’t already, this is often when visitors download our free e-Book, 5 Ways to Help Your Child Sleep Through the Night. Well, this gives you some ideas about an appropriate schedule for your newborn, but keep in mind that all babies are unique and some are more predictable and easy-going than others. Spirited babies tend to be more challenging when it comes to schedules. Take heart that all babies do eventually get into a rhythm, though not all are predictable to the clock. You’ll get to know your baby and his or her unique needs. What is your newborn’s sleep schedule? Apologies if I just missed this portion, but what plan should premies follow? I have 11 week old twins, but they were born 8 weeks early, so have any adjusted age of 3 weeks. Thanks! @Julia – Thank you for reading – for babies born prematurely, you would just want to use their adjusted age at this stage. Hope this helps! @Claudia – Thank you for reading and for sharing with us. Newborn sleep and daytime schedules can be quite tricky to navigate especially for such young babies. It frequently comes down to patience, trial and error! However, it seems as though you have quite a few detailed and valid schedule questions here! As a representative of our Client Relations team, I am not fully trained to answer all of them. Our sleep consultant team would be a much better resource for you – you can read more about them here: http://www.babysleepsite.com/about You may also find help out in our Members Area where you can chat with a Sleep Consultant and with other parents – https://www.babysleepsite.com/diy/ Hang in there, Claudia! Thanks for your question! A catnap is anywhere between 20-60 minutes. Most young babies aren’t taking longer naps yet consistently. I hope this helps!